[C]reated in the mid-1930s for Air Force pilots by Ray-Ban through a commission of the U.S. Government, the aviator has long since made the crossover from “military functional” to “completely chic.” I double dog dare you not to think of Top Gun when aviators are mentioned. These go-anywhere frames are wearable by just about anyone, but an especially great pick for a heart-shaped or triangular face. If you can find a vintage pair you score an extra fifty cool points, but there are several current designers that make excellent options. The classic choice is the original Ray-Ban style, but I love some of the newer riffs on it. 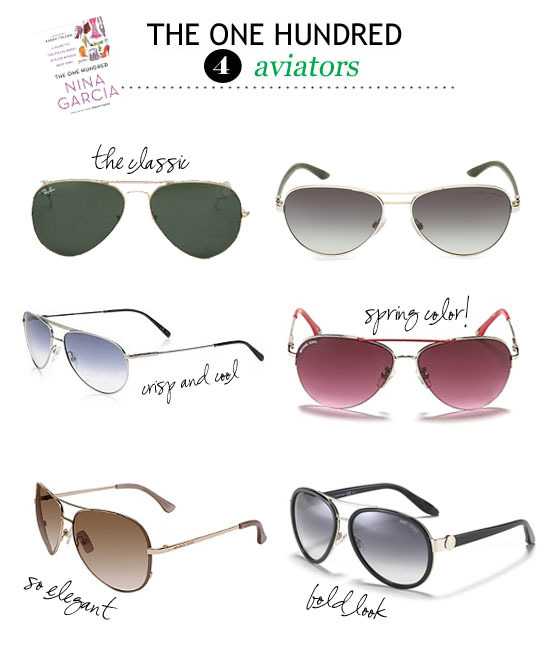 Want to learn more about aviators? Of course you do. Pick up a copy of Nina Garcia’s “The One Hundred” for yourself! We’re working our way through all 100 items to assemble the perfectly stylish, workable collection.